Gisburn Parish is an area of beautiful countryside, with rolling pastures small woodlands, hedge lined lanes and with the magnificent river Ribble flowing through. mountain biking with beautiful views. 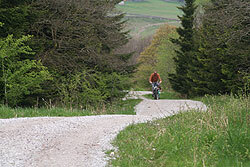 Trails for all levels including family friendly routs. 5) “Register of Services” book for period: - 21st May 1930 to 31st December 1946. If you have any information about the whereabouts of any of the above please email barrie@ribblesdale.net. Festival Bowland a year round calendar of events in and around the Forest of Bowland and Ribble Valley.